Industrial metal has become rather institutionalised since the rise of bands like Nine Inch Nails and Ministry, but few know that a British band may have invented the genre. Godflesh is the brainchild of GC Green and Justin Broadrick, and especially the latter is probably one of the most underrated artists ever. Founder of Napalm Death in the early 80ies, Broadrick decided in the late 80ies to team up with Green and Paul Neville (who later left the band) to play brutal, crawling, lava music under the name Godflesh. Their debut LP Streetcleaner was a huge success, and the following years gave us more albums and also tons of remix records. The year 2001 shows Godflesh in a new light though. No longer affiliated to Earache Records, they released their first CD Hymns for Music For Nations, and it is quite a killer. Of course you will never find the catchiness of a NIN album here, but despite their brutality, Godflesh find moments where they mellow out, like Anthem. 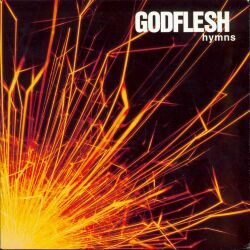 One of Godflesh's most important means is monotony, which create a hypnotic effect you normally only find in the techno and ambient genre. Not everybody's cup of tea, but it sure works with Godflesh. The louder you listen to their music, the better it becomes. It is sad, and surely not all too fair, that Godflesh are so influential but are also doomed to stay in the underground while the bands they actively influenced are making the big money, but that shouldn't be the listeners' concern. We have a band that still emphasises its own integrity, and Hymns is one of the better albums of the genre. Now of course we may wonder if 74 minutes is not a little bit overlong for an album like this, as a more compact running time would make it easier to listen to the album in one run, but I still prefer this to any modern Mac Industrial band of the musical fast food age. 8 heavy sludgy points!